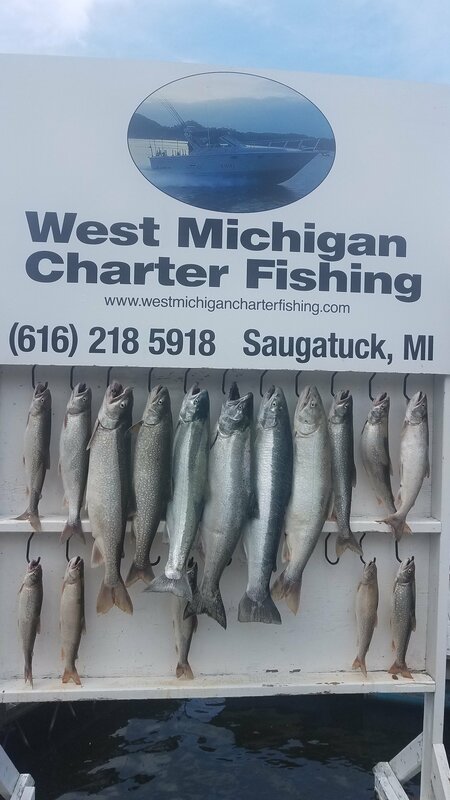 Fishing remains steady from the port of saugatuck. Today we fished that 90 to 120 with 105 being our best. Lake trout seem to be plentiful as long as you stay within 10ft of bottom. Today a chrome blue whirly gig was best for them behind a chrome 8 in spindoctor. The water is setting up nicley and cleaning up by the day. Anyday now the kings will show up in good numbers. Today one of our steelhead and the king we caught came on a mountian dew 8 inch spinny with a mirage fly on a 200 copper the other stewlhead came on a double orange crush on a 100 copper. Good luck out there!